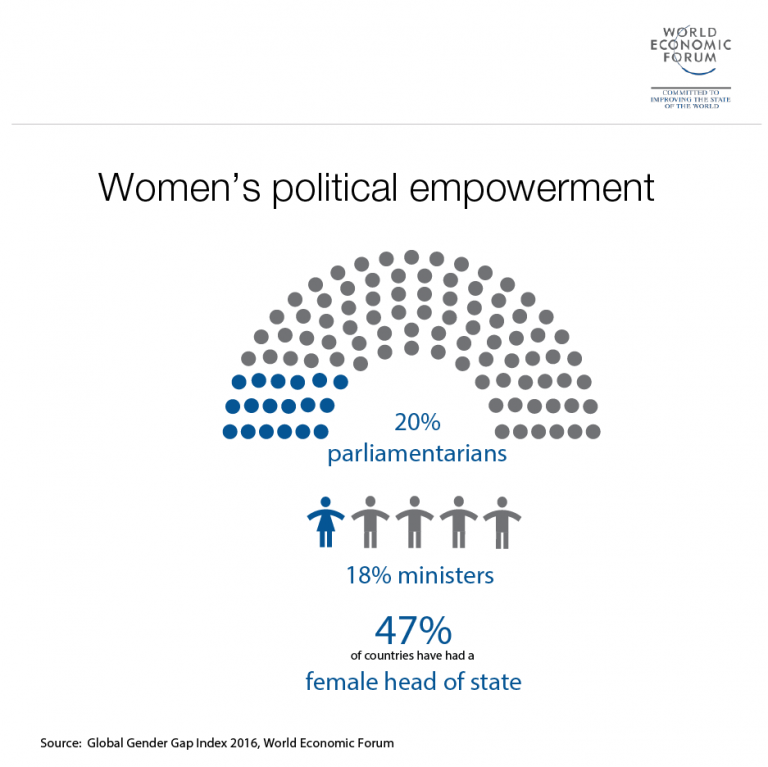 The U.S. election highlighted the gender inequality on the world stage. Before America and the world settle in firmly to the new Donald Trump-based reality, let’s take a little trip down the road not taken. Suppose we had woken up last Wednesday morning to a President-elect Hillary Clinton. And let’s say that, instead of former Portuguese Prime Minister António Guterres, New Zealand’s Helen Clark or Bulgaria’s Kristalina Georgieva had been picked to succeed Ban Ki-moon as United Nations Secretary-General. Clinton would have joined the United Kingdom’s Theresa May and German Chancellor Angela Merkel, helping achieve critical mass in the G7. And a female UN Secretary-General would have placed women at the helm of two of the world’s three biggest international organizations (France’s Christine Lagarde already runs the International Monetary Fund). With so many female leaders, we would have begun to answer the question: what happens when women run the world? Would the world be better for women? Would it even be different? According to sociologists, female leaders are of two schools: Queen Bees, who are less likely to help other women advance, and Righteous Women, who make the advancement of other women a priority. Most early pioneers, such as the UK’s Margaret Thatcher, India’s Indira Gandhi, and Israel’s Golda Meir, were Queen Bees; all of them eschewed feminism. More recently, Righteous Women have prevailed. Leaders like Argentina’s Cristina Kirchner, Brazil’s Dilma Rousseff, and Iceland’s Jóhanna Sigurðardóttir have all sought, in one way or another, to empower women and help them advance in their countries. Merkel and May have tended to be more like Queen Bees, while Clinton, Lagarde, Clark, and Georgieva are more like Righteous Women. To be fair, the first woman leader in a male-dominated culture must often outman the men. Seeking to advance other women can highlight her own womanhood and thereby weaken her. Clinton, for example, was the third woman US Secretary of State but the first who felt secure enough to be able to champion the cause of women and girls worldwide. As President, she pledged, half her cabinet would be women, and she would further the State Department initiatives launched during her tenure. Yes, she also would have been careful to avoid being defined as a woman president. Still, just the presence of a plurality of women has an impact. For example, studies of US courts with multiple judges show that male judges are more willing to hear bias cases when one woman is on the bench, and significantly more willing when a second woman is added. “Each of us,” noted Sandra Day O’Connor, the first female member of the US Supreme Court, who was renowned for not wanting to be perceived as a “female” justice, “brings to our job, whatever it is, our lifetime of experience and our values.” In other words, women bring a fresh perspective, heard clearly only when a critical mass of them is present in any institution. Consider a woman’s perspective on conflict. Evidence does not support the stereotype that women are more pacifist than men – the peacemakers and settlers of male disputes. Women can be Amazons; recall Thatcher’s prosecution of the Falklands War and her admonition to George H.W. Bush not to “go wobbly” in the run-up to the first Gulf War. On the other hand, when men see wars, they naturally imagine the world of the warriors, whereas women see themselves in the women who must try to shelter their families from forces they cannot control. That is precisely the diversity of perspective that is vital to decision-making. And indeed, the Institute for Inclusive Security at Harvard’s Kennedy School has tracked the differences women make as part of peace negotiations. An acute awareness of the magnitude of civilian suffering in conflicts such as the Syrian civil war or the ongoing horrors in the Congo Basin, and an appreciation of how cycles of violence perpetuate themselves over generations, can actually make women much more likely to urge the use of force in interventions. Former US Secretary of State Madeleine Albright famously chided Colin Powell for his reluctance to involve the US military in the Balkans in the 1990s, in part because of her own family’s experience as Czech refugees from Communism. Overall, a woman leader’s decisions are no more predictable than a male leader’s. Women are not monolithic: they have various ideological backgrounds and diverse governing styles. But when the world finally reaches the point when women are not a rarity at the tables of power, when their numbers reach a tipping point, their voices will be heard differently, and their opinions will hold more weight with the men around them. Women came closer in 2016 than in any other era to reaching that tipping point. But we may still have to wait decades to find out what will happen when we finally do.